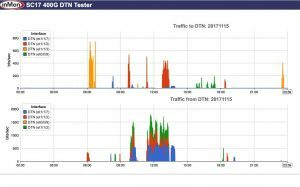 Phil Reese’s team in the Stanford booth at SC17 spiked the utilization of SCinet’s DTN link up to 72 Gbps of data overnight between Colorado and California. When actor Kevin Costner made famous the phrase “If you build it, they will come” in the 1989 fantasy “Field of Dreams,” the first SCinet was three years from inception. 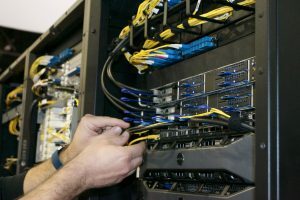 While much has changed since SCinet’s premiere in 1992, the notion that building record-shattering high performance networking will spur innovation remains a foundation of SCinet and SC. On Tuesday night a Field of Dreams scenario materialized between SCinet at the Colorado Convention Center and Stanford University in California. SCinet architect Marc Lyonnais explained what happened. SCinet’s Data Transfer Node (DTN) and BBR protocol made it possible for Stanford’s Phil Reese to transfer data at a rate of 72 Gbps between Colorado and California. “I reached out to [SCinet] and they reached out to me. We actually got a real nice test overnight that showed a major change of speed using the protocol called BBR, a congestion control protocol.” Without BBR Reese saw 50 Gbps speeds on a link that could produce up to 100 Gbps. Stanford and SCinet then pushed the utilization of the link up to 72 Gbps of data overnight between Colorado and California. He noted there’s definitely a practical purpose behind the experiments he’s done from the floor of SC17. SCinet provisioned the DTN for a limited number of experiments to explore this key technology. What they didn’t predict was how popular the service would be among the immediate community of researchers on the show floor. Reese arrived from California not knowing the resource was available but had a need to explore new data transport technology. 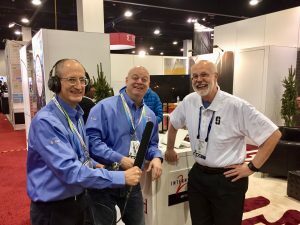 The iconic quid pro quo “If you build it, they will come,” thus came to fruition at SC17 in Denver.